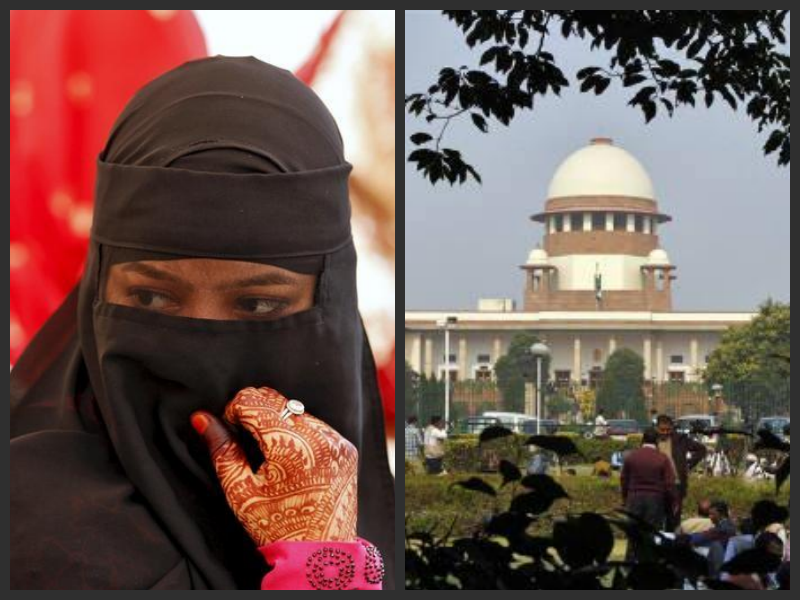 Even if the Supreme Court ultimately invalidates triple talaq, it remains to be seen whether the apex court will test the practice against the fundamental rights of equality, non-discrimination and personal liberty. On the day India’s Supreme Court closed for summer vacation, it began hearing the contentious case regarding the validity of triple talaq. A five-judge constitutional bench headed by Chief Justice J.S. Khehar heard arguments in Shayara Bano vs Union of India from May 11-18 and has reserved the case for judgement. In this case, the petitioner Shayara Bano, a divorced Muslim woman, challenged the constitutionality of the practice of triple talaq along with other practices under Muslim personal law like nikah-halala and polygamy. The Supreme Court, however, clarified that it will only examine the legality of the practice of triple talaq or talaq-e-bidat. The positions of the various parties in this case differ in terms of reliefs sought as well as the grounds for relief. One position, furthered by the likes of Bharatiya Muslim Mahila Andolan (BMMA), is that triple talaq is invalid as it is fundamentally un-Islamic and hence should not be part of Muslim personal law. On the other hand, the position of the All India Muslim Personal Law Board (AIMPLB) is that triple talaq cannot be subject to fundamental rights challenge as it is uncodified personal law and is an essential religious practice protected under the freedom of religion. A third approach, supported by the government of India and organisations like the Bebaak Collective, is that irrespective of whether triple talaq is part of Islam, it should be struck down as it violates fundamental rights. In adjudicating the case, one of the fundamental questions the court will consider is whether triple talaq is protected by freedom of religion guaranteed under Article 25 of the constitution. In fact, if the court concludes that triple talaq is not part of the Islamic religion, it may not even enter into the question of whether it violates fundamental rights. The text of Article 25 makes it clear that only religious practices are protected and not secular activities related to religion. However, since the 1960s, Indian courts have restricted freedom of religion further through a unique doctrine known as the “essential religious practices” test. As per this doctrine, Article 25 protects only those practices that are essential and integral to the religion, as determined by the courts. This approach, influenced by colonial-era adjudication of personal laws, has resulted in judges of secular constitutional courts examining the validity of specific religious practices by testing it against religious canons instead of constitutional norms. While the AIMPLB has argued that triple talaq is an essential practice within Islam, the petitioners, the central government and organisations like BMMA and Bebaak Collective have all argued that it is not. The AIMPLB argued that for the Hanafi school of Islam, which a majority of Indian Muslims adhere to, talaq-e-bidat is an essential practice that has been followed for 1,400 years. The AIMPLB, however, weakened its case when it admitted to two things – first, that talaq-e-bidat is sinful, patriarchal and bad in theology, and second, that talaq-e-bidat can be avoided by putting a stipulation to that effect in the nikah-nama (the marriage contract). If triple talaq is sinful and also an optional practice, it would be difficult to establish that it is an “essential religious practice” that is protected under Article 25. However, even if triple talaq is protected under the freedom of religion, it is important to note that there are certain limitations to it within the constitutional text. Under Article 25, freedom of religion is not absolute but is “subject to public order, morality and health, and to the other provisions of this part”. Hence, the right to practice triple talaq is subject to morality as well as the fundamental rights to equality, non-discrimination and personal liberty laid out in Articles 14, 15 and 21 of the constitution respectively. If the court tests triple talaq against fundamental rights, it would be a difficult practice to uphold. The practice of triple talaq gives a Muslim man the right to divorce his wife unilaterally, with the wife not having any say in the matter. However, a Muslim woman can obtain divorce only by approaching the court on the specific grounds provided under the Dissolution of Muslim Marriage Act, 1939. This violates the right to equality and non-discrimination at two levels – first, it discriminates between Muslim men and women as it only confers men the privilege of unilateral talaq and second, it discriminates between Muslim women and women of other religion who possess more legislative rights. However, invalidating triple talaq for violating fundamental rights is not as straightforward as it seems. It would require the court to examine whether Muslim Personal Law comes within the meaning “laws” or “laws in force” under Article 13 of the constitution. This is because only laws coming within the purview of Article 13 can be struck down for violating fundamental rights. Interestingly, the landmark case on this question is the 1951 judgement of the Bombay high court in State of Bombay vs Narasu Appa Mali, which held that uncodified personal laws are not “laws” or “laws in force” under Article 13 and hence not subject to fundamental rights. Unlike the Hindu personal laws passed by the parliament in the 1950s, the Muslim Personal Law (Shariat) Application Act, 1937 does not substitute, alter or codify Muslim Personal Law, but merely makes the Sharia applicable for Muslims on matters such as marriage, divorce etc. Hence, parties like AIMPLB have argued that Muslim Personal Law is not codified and is immune from fundamental rights challenge. The AIMPLB’s stand however seems duplicitous since it is seeking protection of triple talaq under the fundamental right to religion but also claiming that the practice is not subject to other fundamental rights. Even if the Supreme Court ultimately invalidates triple talaq, it would also be important to examine the path that it takes in arriving at its judgement. There are multiple approaches of adjudication possible. The path of least resistance would be to not interfere with the practice of triple talaq and rely on internal reform. On this regard, the AIMPLB has already submitted an affidavit stating that it will give an advisory to those officiating Muslim marriages to advise the bride and bridegroom to incorporate a condition in the nikah-nama to exclude triple talaq. The next option is a minimal interventionist approach which holds that triple talaq is fundamentally un-Islamic or that it is not an “essential religious practice”. The court can then invalidate triple talaq by interpreting “talaq” under the 1937 Shariat Act to exclude talaq-i-bidat. The more audacious option before the court is to test the practice of triple talaq against fundamental rights to equality, non-discrimination and personal liberty. This can be done in two ways. First, by distinguishing the present case from Narasu Appa Mali and interpreting the 1937 Shariat Act to argue that it has already codified Muslim Personal Law and hence subject to fundamental rights. Second, by overruling Narasu Appa Mali and holding that all personal laws, whether codified or uncodified, are subject to fundamental rights. If the court decides to adopt the second option, it would settle the debate on the primacy of fundamental rights over personal laws and also redefine the relationship between the state, religious community and the individual. Mathew Idiculla and Satya Prasoon are with the Centre for Law and Policy Research, Bengaluru.